There were two main problems that faced the early bus and tramway operators with regard to fare collection. One was that of fare dodgers and the other was the possibility of conductors who would fiddle the takings, though it's only a very small minority who would do such things. The solution to these was the Bell Punch ticket system. This was quite ingenious as the system had methods to defeat both, however it was very labour intensive. The tickets would have the stage numbers or stop names printed along each edge. The Bell Punch machines themselves punched a hole in the ticket on the appropriate stage (sounding a bell at the same time) and the clipping was retained in the machine itself. 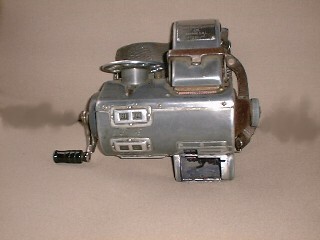 The early version was the pistol punch, which resembled a ticket clipper, but with a cylindrical chamber to hold the clippings. 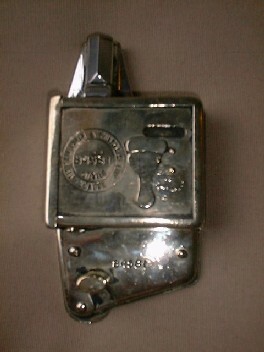 The later version clipped to a strap and was worn in the same way as the cash bag. The conductor had a rack of tickets, each ticket with a serial number and issued to the conductor as a stapled "book". Each denomination would have a different colour so that the clipping could be identified later. At the end of each journey the conductor would record the serial number of every top ticket on the rack on the waybill. The inspectors who would randomly board the trams or buses to check the tickets would use this. At the end of the day, the Bell Punch would be opened and the clippings counted by "confetti counters". This would be used to calculate what the conductor's takings should be (any shortfall being deducted from his wages). The big disadvantage of this system was that it cost a lot to administer. It was also rather cumbersome for the poor conductor who had to carry a large wooden rack, which would get in the way when punching the ticket (an operation that requires both hands). Bell Punch machines were widely used throughout the Black Country tramway systems. Similar to the Bell Punch were the Williamson punch machines, however the lever operation allows the machine to be used with either hand and is easier to use (I have used both at the Black Country Museum). The other advantage of the Willamson is that it will clip two tickets at once, which is why we use it more often that the Bell Punch, which will only do one at a time. A slightly more advanced machine was the TIM (which stands for "Ticket Issuing Machine"). 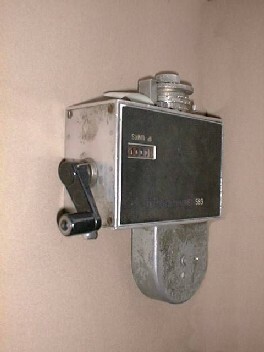 This had a dial that allowed the selection of 10 different values and printed a ticket on plain paper. It was easy to use and had 10 counters that automatically kept a tally of the different values issued. Also the machines printed a stage number (set by the conductor) and the date so that the inspectors could still check the correct fare had been paid. The system, however, was not flexible enough to deal with fare increases easily. Each machine would have to have its printing plates replaced. The system was used experimentally for a time in Wolverhampton from the late 1930s to 1948, when the Ultimate system replaced both TIM and Bell Punch systems. The Bell Punch Company produced an automated version of their pre-printed ticket system, which they called "Ultimate". These used continuous ticket rolls with the values printed on them. Each ticket carried a serial number and a pre-printed value. The machines had several tracks each of which had a lever at the front that ejected a ticket, which was then torn off against a serrated cutter. The fare stage could be printed in one of three positions on the bottom of the ticket. Each new ticket roll had a piece of adhesive tape (which the conductor had to lick) to join it to the end of the old one, which was supposed to prevent the conductor having to change rolls mid-journey. The system coped better with changing fare structures, but after a while, the machines became unreliable and would jam up. It was not uncommon to see conductors tearing off tickets from the back of the machines at busy times. Its also not that uncommon at the museum! In the West Midlands, this system was used by West Bromwich, Wolverhampton and Birmingham. Another system using plain paper was the Setright. Unlike the TIM, the Setright could print any value in shillings and pence. Many were converted to take pounds and new pence after decimalisation. This meant that they could easily deal with changes in fares. A set of concentric dials on the top was used to set the value and levers set "Adult", "Child", etc. and "In" or "Out" to indicate which journey. This system was used by Walsall and the Birmingham and Midland Motor Omnibus Company (BMMO), which was better known as Midland Red. Both of these operated extensive routes, which allowed very long routes to have a large number of fare stages. BMMO used pink ticket rolls, while Walsall's were plain white. It was also common for the top and bottom border of the side to be printed on to have the undertaking's name. The machines were very reliable and less cumbersome than the Ultimates. They're not quite as easy to load as the TIM machines as the new roll has to be fed through the centre, but a lot easier than the Ultimates and also far less likely to jam. They make a distinctive whirring noise as each ticket is issued. This is much appreciated by the visitors to the museum who remember them in use - as do some of us using them! With the advent of WMPTE, a wholesale conversion to driver only operation took place. Both Ultimate and Setright had machines for drivers to use, but the system chosen was the Autofare. This used a mini-safe to collect the fares and meant that no change could be given. It isn't very popular with passengers, but if everybody at a stop had the correct fare ready, the passengers could get on very quickly. In practice, passengers have to ask round to get change (which slows loading) or get refused entry (which gives rise to complaints). With microprocessors, modern ticket machines print far more information. It is usual for a modern ticket to state where the passenger boarded and how far they are permitted to travel. Some of the latest ones even have a GPS system that sets the fare stage automatically.